Anyone who’s ever had a baby (myself included) can tell you that pregnancy is a journey. Your body goes through so many changes that it's hard to keep track—and many of these changes, you have no control over! So it's nice to take charge of the things you can control like staying healthy and keeping active. At least in my case, the more I kept moving during pregnancy, the better I felt. Here are our favorite apps to keep you fit during your pregnancy journey. Think of this app as a virtual personal trainer for your entire pregnancy. In partnership with “Fit for Birth” pre- and post-natal exercise specialist Nancy Anderson, this program is the first of its kind to outline and walk you through pre-pregnancy fitness, trimester-by-trimester training and post-baby workouts. It doesn't matter if you're in or out of shape, because Pear Fitness knows that the only shape you're moving toward is round. 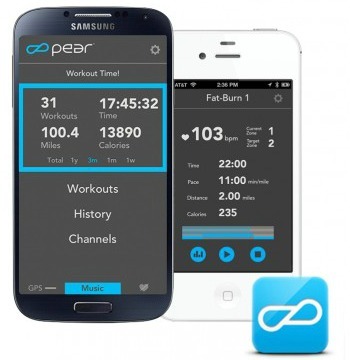 This app is designed to keep you motivated and moving. The workout programs are easy to follow, and words of encouragement from Anderson keep you motivated. Log all of your achievements and share with like-minded preggo friends. You might have used Glow when you were trying to conceive, since it also tracks ovulation and pre-pregnancy health. Now it's time for the next step with Glow Nurture for all of your pregnancy tracking needs. 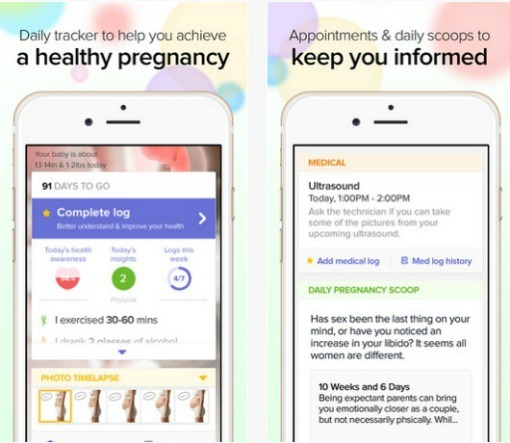 You can literally log everything about your pregnancy: exercise, weight gain, doctor's visits, symptoms and more. Sync your app with your partner's so you two can share all the information together. And if you like making lists, Glow Nurture helps you do that too—hospital bags, registry items and questions for doctor at each timed visit. Glow Nurture’s interface is clean and bright, making it easy to use. You’ll look forward to daily advice and articles tailored to your pregnancy including a kick counter, contraction timer and twin pregnancy support. Unique to this app is the super helpful support for the postpartum period, also known as the fourth trimester, including breastfeeding logs for feedings and pumping. Did you know that your seven-week-old fetus is the size of a blueberry? You would if you had the What to Expect app for the iPhone and Android. Turns out the popularity of this app is not only based on the wide reach of the bestselling books with the same name, but also for stunning visuals that really help you get a feel for what's going on inside of you. 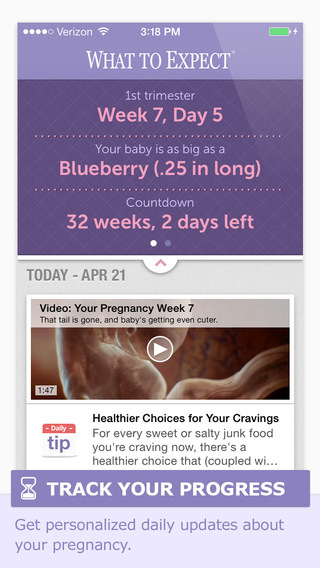 Browse by pregnancy guides going week by week and day by day. Then log on for access to an online community for support and advice. The Internet can be the worst place for questions about your pregnancy. You could end up with all sorts of misinformation. The only cure for such web-induced anxiety is certified advice from experts — straight talk for straight answers. You can get all this and more on the WebMD pregnancy app. Run through a bunch of handy checklists that you might not have thought about before, including lists for baby gear, grocery shopping, postpartum supplies and more. Upload monthly pictures of your baby bump to build a future slide show, then play them back after nine months to watch your belly grow before your eyes. And while you’re at it, go ahead and download the WebMD baby app, because you'll have whole slew of new questions once the baby arrives. 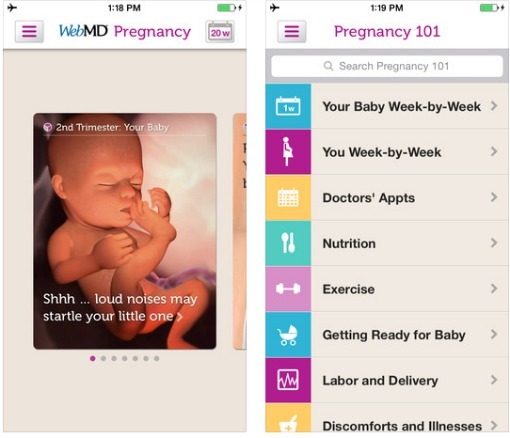 Moms, what are your favorite pregnancy apps? Tell us in the comments below.